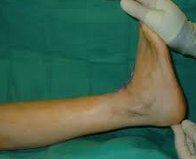 An ankle equinus deformity is not a medical condition as such but is more reflective of a condition where the foot is unable to dorsiflex, or bend upwards at the level of the ankle joint. As a result of this condition, there are many foot and ankle problems that can occur. Patients rarely present to the office complaining of a restricted range of motion in the ankle, but rather present with one or more of the problems that this condition can create. The problem is defined as insufficient dorsiflexion in the ankle in order for normal gait to occur. This lack of dorsiflexion then requires the lower limb to compensate in some capacity to make up for this lack of motion. There are various opinions as to what is normal ankle dorsiflexion but in general 10 degrees or more dorsiflexion is considered normal. This amount of ankle motion has to occur with the knee joint extended (locked). It is generally accepted that dorsiflexion between 5-10 degrees is associated with minimal foot and leg compensation during gait, while dorsiflexion below five degrees is associated with significant gait compensation as well as an increase of pressure on the forefoot which increases the risk of forefoot pathology. The picture to the right reveals zero degrees of dorsiflexion. There are a few different ways to classify equinus based on the causative factors. Some of these classifications have become complicated. Thus it is easier to classify this problem based on either osseus (bone) or soft tissue restrictions. The most common cause is known as gastroc-soleus equinus. This results from a shortening of the co-joined tendon of the gastrocnemius and soleus muscles as they come together to form the Achilles tendon. Damage to the Achilles tendon from either trauma or collagen disease may also cause a limitation of ankle motion. 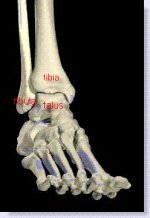 bone spurs on the talus bone, which is the foot bone that the tibia and fibula bone “hinge” to, may also cause an equinus deformity. The importance of the ability of the foot to dorsiflex relative to the leg occurs during what is known as the stance phase of gait and the swing phase of gait. In gait, when the heel hits the ground, the body then moves over the foot, and the ankle joint has to be able to dorsiflex in preparation for propulsion where the foot propels the body forward. If there is not enough dorsiflexion in the ankle, at this stage, then there is excessive pressure exerted on the forefoot and this can lead to pathology. After the foot propels the body forward, the foot itself then has to swing forward while weight is being put on the other foot. In order for the foot to swing forward, dorsiflexion of the foot relative to the leg has to occur in order to avoid dragging the toes on the ground. In the above situations, if there is not adequate dorsiflexion occurring at the level, the body then has to compensate for this deficiency. If the body is unable to compensate there will be a shortened gait, or limitation in stride. If compensation does occur it will happen in the joints either in the foot itself or the joints above the ankle. Above the ankle, compensation may result in a hyperextension of the knee which is increased motion in the knee joint, or compensation may also occur at the level of the hips which result in over flexion of the hip joint. Although this compensation at the knee or hip joint may allow the body to overcome the limited ankle motion, this may result in knee pathology or even lower back and hip issues. There are various treatments for an equinus deformity ranging from conservative care to surgical care. The goal of all treatments is to try and maintain a relative range of motion within the ankle joint while minimizing any compensation in the foot or leg. Stretching People continuously mention stretching as a means to increase motion in the ankle joint. The problem is that there is a diminishing rate of return as you age. Essentially stretching exercises are truly effective in ages up to adolescence. In this age group, stretching along with perhaps serial casting (in toe walkers) can be very beneficial. Although stretching of the Achilles tendon is usually recommended in adults, the amount of increased range of motion within the ankle joint is usually minimal. However, even a small increase in ankle motion may be enough to be the difference between pain and no pain. Suffice it to say that in an adult, stretching is usually only one part of the equation in trying to negate the effect of a tight heel cord. Keep in mind, stretching will not be of much help in an osseus (bone) deformity. Heel lifts For many simple equinus related problems, a simple heel lift to both heels, even though there may only be symptoms in one foot, can be very beneficial. This is particularly true for those suffering from Achilles tendonosis. Usually a one quarter inch cork heel lift is all that is needed. Orthotics For many problems occurring in the forefoot and midfoot, an orthotic with an external rearfoot post is what is indicated to alleviate pain. Most of these problems are not only the result of an equinus condition but are also exacerbated by the excess pronation that occurs to compensate for the lack of motion in the ankle. So not only do we have to control the tight heel cord, but we also have to reduce the pronation that is occurring. An orthotic with a rearfoot post means that the back portion of the orthotic which generally controls motion in the heel as the heel hits the ground, is built on the bottom of the heel portion of the orthotic. It is what is known as posting. Essentially, posting changes the angle at which the heel hits the ground. Because this external posting has thickness to it, it also acts as a heel lift thus reducing the strain on the achilles tendon while the orthotic itself reduces pronation during midstance of gait. These types of orthotics are usually of the custom made variety because you are asking the orthotic to do a couple of functions and for that reason the measurements of the orthotic have to be exact. 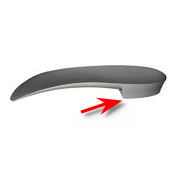 You will not find that in a medical grade orthotic, or any other device you may purchase in a store. In cases that do not respond to conservative care, surgical intervention has to be considered. Cases of equinus due to bone impingement have a greater tendency to not respond to conservative care and thus become surgical issues. In these cases surgical removal of the boney impingement is the indicated treatment. An Achilles lengthening procedure may also be done at this time. There are many soft tissue procedures for Achilles tendon lengthening. The chosen procedure is the one that deals directly with the soft tissue cause of equinus as determined by the surgeon.